Material: Fleece/Polyethylene Terephthalate (PET)Width: 60"
Ponte roma Leopard Stretch Viscose Jersey Print Fabric Material. This double jersey fabric is of heavy double knit interlock construction giving it superb durability, weight and stretch. It looks expensive and would be equally appropriate for casual and formal attire. Cow Print Velour Velvet Fabric Material. Condition is New. Dispatched with Royal Mail 2nd Class. Zebra Print Velour Velvet Fabric Material. Condition is New. Dispatched with Royal Mail 2nd Class. It looks expensive and would be equally appropriate for casual and formal attire. Smooth Shiny Clear Foil Animal Print DanceWear. Stretch Viscose Jersey. Black Colour. · You will get one continuous piece as material is cut directly from the roll. Printed Cotton fabric with a Black and Grey Leopard Skin design on a Off White background. 100% COTTON. Liquid Satin Material. Soft Smooth Silver-Black Animal/Leopard Print. Ideal fashion fabric. You will get one continuous piece as material is cut directly from the roll. Excellent material for various uses. 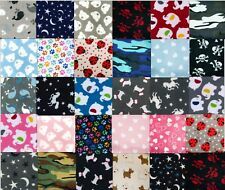 Lovely cotton jersey fabric is ideal for making any girls, babies clothing such as leggings, t-shirts, hoodies, and more sewing projects. Content: 95% cotton, 5% spandex. It looks expensive and would be equally appropriate for casual and formal attire. Double Knit Viscose Jersey in a Stunning Black and Grey Colour. Smooth & Soft Animal Print. · You will get one continuous piece as material is cut directly from the roll. Half Metre of Quality Cute Red Indian Bear Grey Print French Terry Jersey Half Meter Knit Stars loop back jersey 250g/m2 weight 150cm wide Your fabric will be cut in one continuous piece. This listing is for Bio Oeko-Tex Standard 100 Certificated (Tested for harmful substances) Half Metre of Quality 95% Cotton 5% Elastin Pink Leopard Print 210g/m2 weight 150cm wide Your fabric will be cut in one continuous piece. Pink marl coloured cotton with family of elephants in a line across the fabric. Great for quilting, dress making, bunting or many other christmas crafts. Great quality 100% cotton fabric. Pattern repeat approx 20 cm. 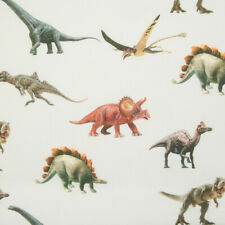 100% Cotton 60 in wide 150 cm wide. Allison’s Craft Emporium. BEAUTIFUL BIRD & LEAF 100% LINEN DRESSMAKING FABRIC. The width is 150cm. 100% L inen fabric in a taupe bird & leaf pattern on a beige background with white script. 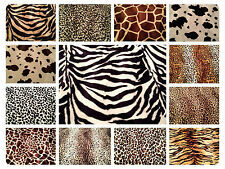 Lovely animal print 100% cotton fabric ideal for any kids clothing, craft sewing or quilting. Content: 100% cotton. Poly cotton Soft Non Stretch Dragon Fly Fabric. Condition is New. Dispatched with Royal Mail 2nd Class. Est. delivery dateEst. delivery Fri, Apr 26Colour: GreyMaterial: CrepeWidth: 60"
Lovely double border cotton poplin fabric of cat on bicycle, printed on both border of white fabric with small flowers is ideal for any sewing project such as girls dress, skirt or even patchwork or craft project. Soft Smooth Black-White-Pink Animal Hearts Print. Liquid Satin Material. Ideal fashion fabric. You will get one continuous piece as material is cut directly from the roll. Excellent material for various uses.